Emergency Medicine physicians are arguably the most versatile among their medical colleagues, often performing a range of treatments for a variety of ailments to a wide spectrum of patients. The role of an emergency physician is both complex and demanding, easily making it a stressful path for an aspiring physician to pursue. A number of medical school students opt to specialize in other areas such as cardiology, podiatry, or radiology. Aside from the versatility of the emergency physician, what makes them so valuable to the medical field is the amount of work they do and the level of stress they endure in comparison to other physicians. Questions remain, however, as to whether the typical emergency physician salary equates to fair compensation for the workload they take on. 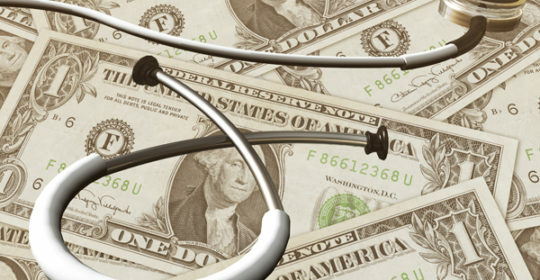 What is the Average Emergency Physician’s Salary? According to a survey from the Medscape EM Physician Compensation Report, emergency physicians take home an average annual salary of $340k. This ranks emergency medicine physicians among the top 15 physician specialties, making it a very lucrative position to obtain. Orthopedics, plastic surgeons, and cardiologists rounded out the top three, with each position earning over $400k annually. Region plays a factor in the emergency physician salary as well, with average annual salaries reaching up to $395k and going as “low” as $311k. EM physicians who are self-employed earn over $70k more than those employed full-time by hospitals and medical facilities. Another factors that contribute to the difference in an emergency medicine physician salary includes gender. 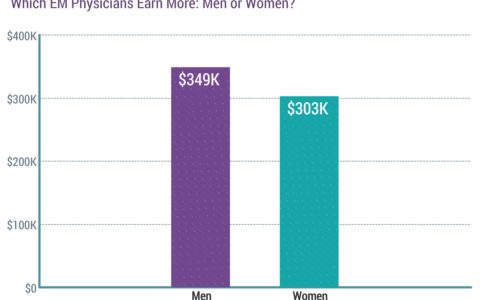 Male EM physicians earn 15% more than their female counterparts. A trend that has maintained its consistency for years, although a reported 26% of women physicians are part-time practitioners compared to 17% for men. Interestingly, only 68% of the surveyed group felt that the emergency physician salary is fair compensation. Of the 32% that felt they deserved more, nearly half believed their salaries should be 11% to 25% higher. Still, compared to the other physician specialties, the emergency medicine physician salary ranked the highest in satisfaction with their compensation. The average annual salary for foreign-trained emergency physicians was lower than that of their domestically trained colleagues, but not by much. 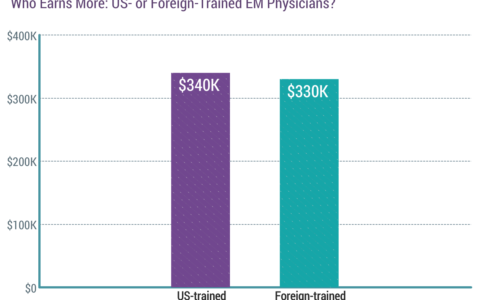 Those who studied outside of the U.S. made an average salary of $330k, in contrast to the $340k that domestically EM physicians earned. Regardless of the earnings, the majority of polled EM physicians stated that the most rewarding aspect of their profession was that they were able to excel in their roles and find the solutions to the problems that affect their patients. Most emergency physicians occupy positions in hospitals in which they must tend to a tremendous variety of patients. The patients they are tasked to treat are often more difficult than those of their colleagues and come from all walks of life. Although physicians in general do not have unlimited discretion in choosing their patients, those in private practices at least have some sort of leeway in refusing a patient. Emergency medicine physicians aren’t afforded the same privileges. Those who are employed by hospitals must treat patients that are heavily influenced by drugs and alcohol. Other patients may be uninsured, violent convicts, homeless people, and/or veterans with serious psychiatric disorders. Emergency physicians work anywhere from 30 to 45 hours a week, which is a relatively non-demanding schedule. The drawback is that most of these hours are during overnight, weekend, and holiday shifts. They may be compensated well; however, there’s a legitimate argument as to whether they deserve more. Consider the life of the everyday working American. The average office worker shows up to work at 9 a.m. and leaves by 5 p.m., and their minds are typically disconnected from their professional responsibilities until the next morning. Their evenings and weekends are spent with family and friends. The same cannot be said for emergency medicine physicians. The twilight hours in which the average person is asleep are instead spent solving life or death situations by emergency physicians. When they eventually get home, they may find themselves without family or friends, due to the isolated style of their lives. This bodes a fair question; are emergency medicine physicians compensated enough? If so, are we taking into account their personal sacrifices in addition to their professional contributions? Contact our Mint Physician Staffing recruiters for more information on emergency medicine physician healthcare job placement and locum tenens careers.